Whoa. What in the hell is that? When I first saw these little pricks, my first reaction was to pull out some roach spray and kill the mother****ers. And how can you blame me? They move like predators, and they look like their heads have been chopped off. That’s some straight up zombie stuff. Anyway, I quickly revised my feelings towards the little mongrels because I knew the P.C. police might come after me for offending our technology obsessed society. So, what are these things exactly?? 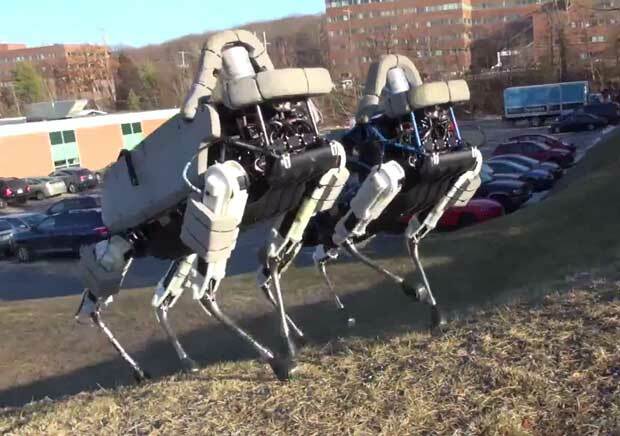 Well, it actually turns out that these little buggers don’t come from an alien civilization; instead, they were built by Boston Dynamics– a company that has been at the robot game for a long time. In fact, over the past decade, the company has done a number of projects for the Army, Navy, and Marine Corps. Now, they are simply owned by the almighty Google. I’d have to say that this IS pretty remarkable. Released just last month, Boston Dynamics’ newest creation is simply known as Spot. Weighing in at 160 pounds, the robot is a more developed version of their previous creation– the Big Dog, which weighed in at 240 pounds. Woof Woof. As far as what Spot is used for, well, it appears that the company will be keeping its close ties with the military, who routinely uses the robot as a pack mule in dangerous areas.